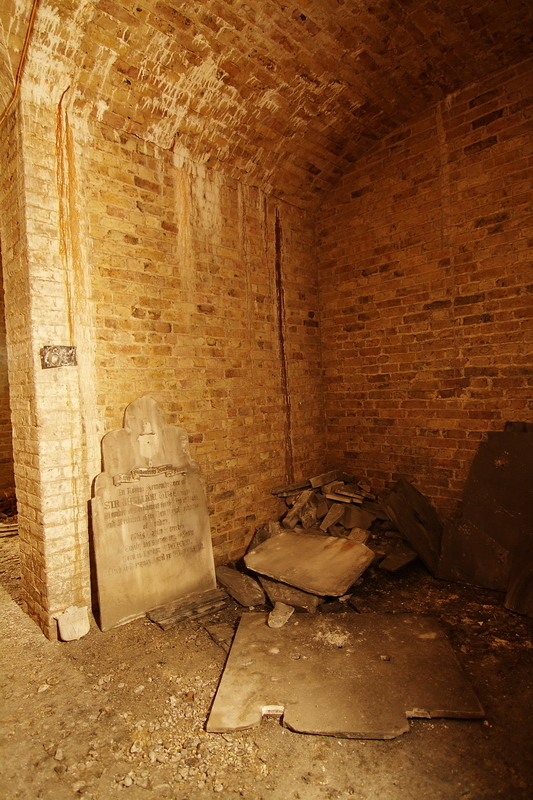 It’s not a well known fact but there are actually two sets of Underground Catacombs present at West Norwood Cemetery and there were originally two chapels, the Dissenters Chapel and the Episcopal Chapel (both with catacombs beneath them). At 05:12am on 17th July 1944 a V1 Flying ‘Doodlebug’ Bomb fell in West Norwood Cemetery and destroyed the Dissenters Chapel and caused severe damage to surrounding buildings, including the Episcopal Chapel. Plans from 1946 have only recently been discovered that show architect Alwyn Underdown had planned to rebuild the Dissenters Chapel but sadly after laying derelict for many years and hoping to be repaired by the Ministry Of Works, both were eventually demolished and in 1955 a more modern crematorium and chapel was constructed (also an Underdown design). In total West Norwood SE27 was to suffer from 13 V1’s and 1 sole V2 and 47 People died in the area. As well as this the cemetery was hit multiple times by Luftwaffe bombers who used the A23 as a guide into Central London as well as many ‘own goals’ caused by unexploded Anti-Aircraft shells falling to ground! Across the path all that remains of the Episcopal Chapel is a Rose Garden which today lies beneath scaffolding and sheets of plastic in place to protect the catacombs beneath from further environmental damage. These catacombs have a tall central gallery and six main aisles (three on each side) containing some 95 bays (see plan below). 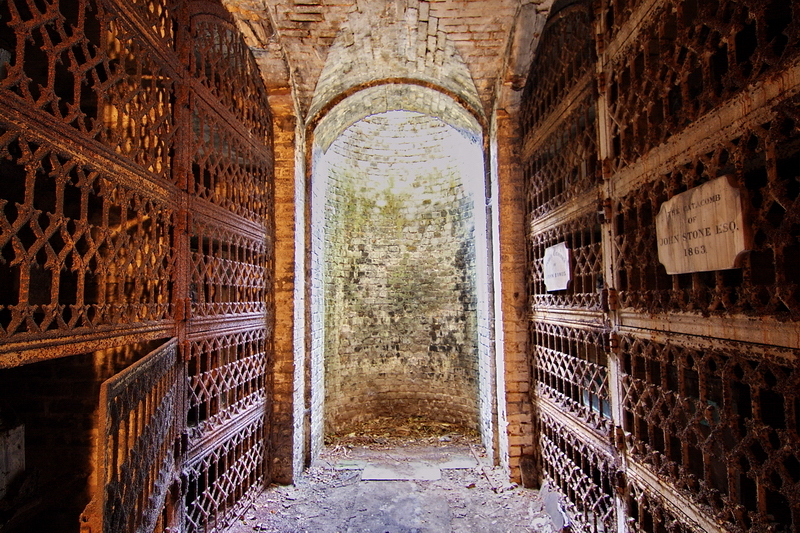 The bays were used in a variety of ways, some contain private vaults while others contain mixed internments. Other bays today contain gravestones from the cemetery above and some are totally empty. installed beside the Dissenters’ Chapel. Sadly, both chapels were damaged during World War II, and a number of monuments were also destroyed or damaged. 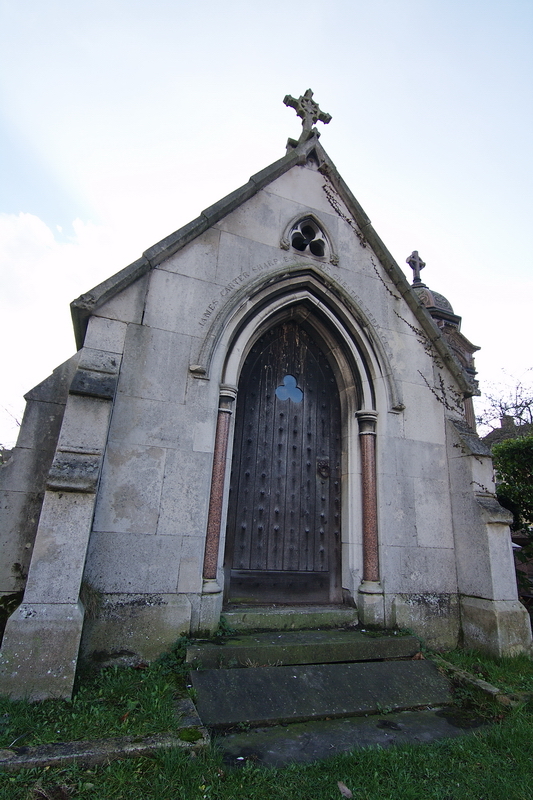 The cemetery lodge, only just rebuilt in the 1930s, was destroyed by a flying bomb in 1944. The Dissenters’ Chapel was demolished in 1955, and replaced by a modern crematorium. The Episcopal Chapel was demolished in 1960 and replaced by a rose garden. 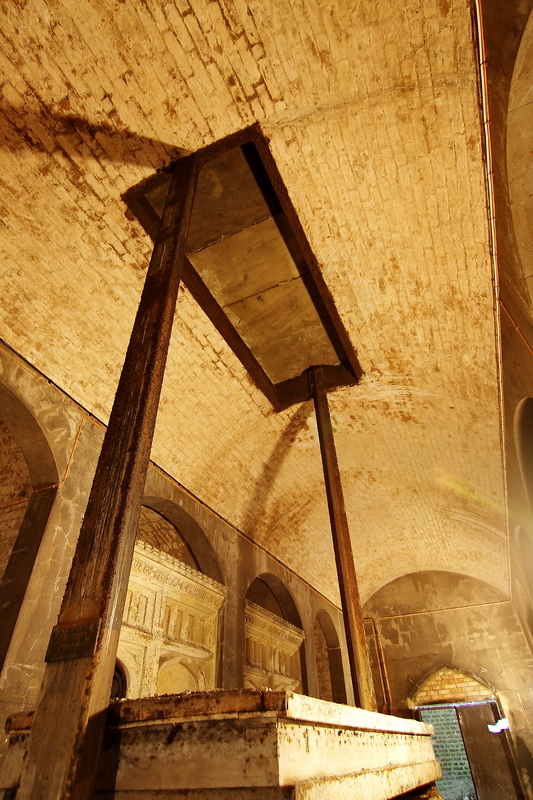 Nonetheless the catacombs below the Chapel still survive: those beneath the crematorium now house the furnaces, but those on the site of the Episcopal Chapel remain complete with some 2,000 coffins, unique architectural features, and a unique hydraulic coffin lift. 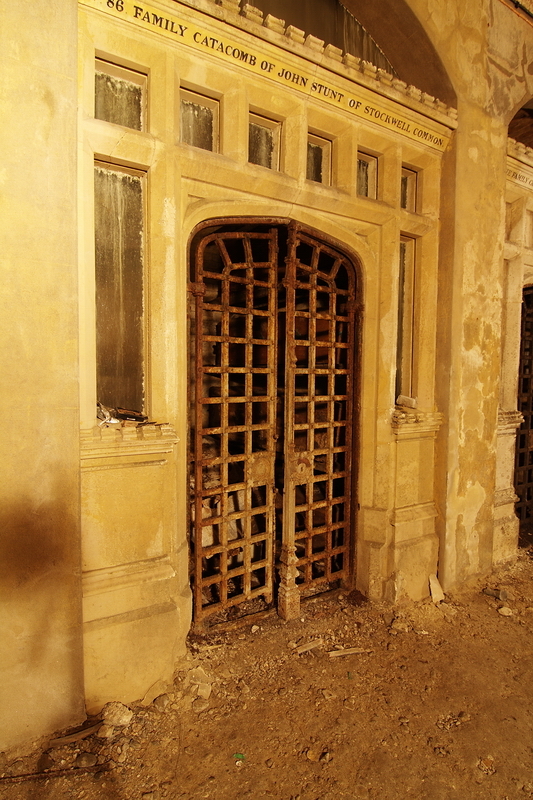 Now listed Grade II, they are sadly closed to public access because of Health and Safety considerations. 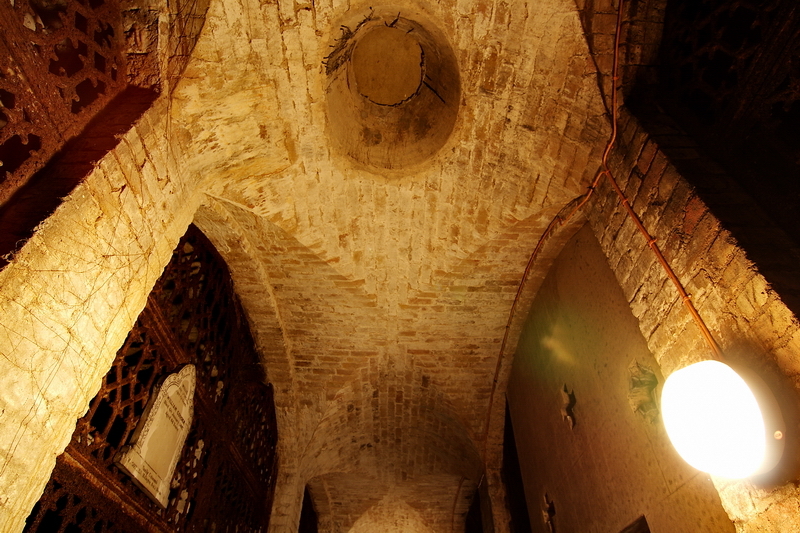 situated beneath the mortuary chapels. 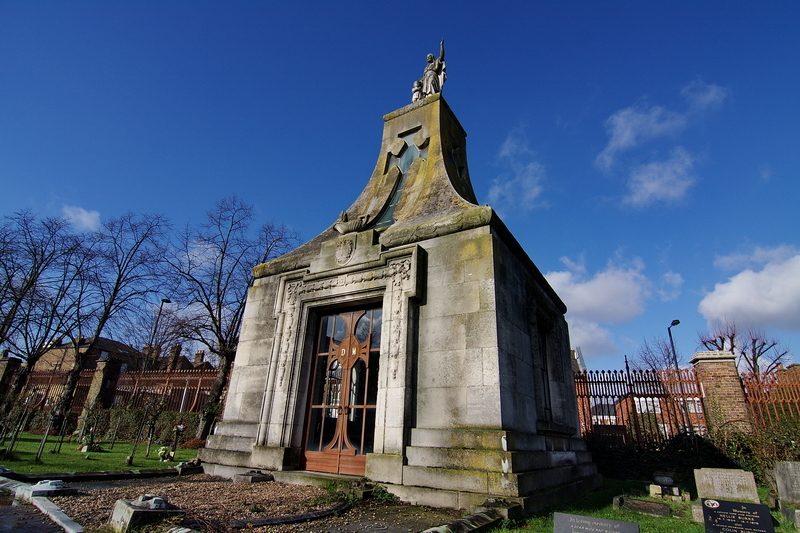 Of the other commercial cemeteries founded in London at this time – Highgate (1839), Nunhead (1840), Abney Park (1840, wholly for dissenters), Brompton (1840) and Tower Hamlets (1841), catacombs only featured in the designs of Brompton and Nunhead, although the famous Egyptian Avenue at Highgate performed a similar function above ground level. 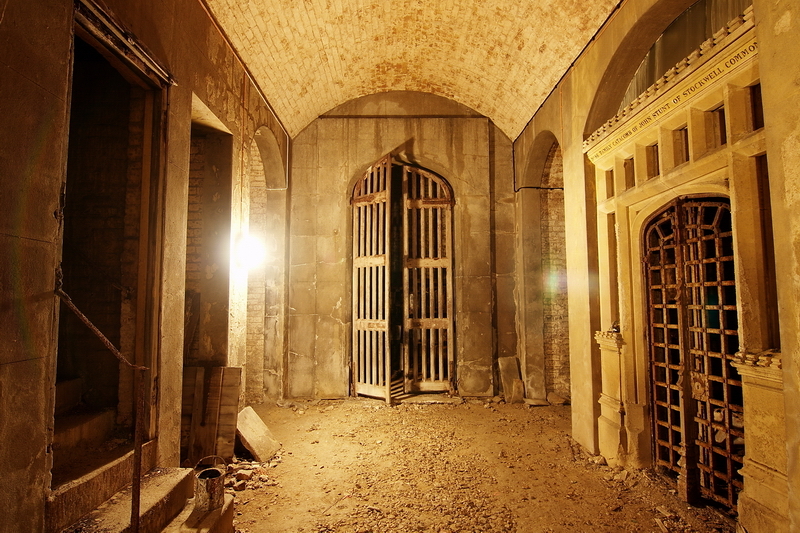 The Brompton catacombs, whilst still accessible, are not on the scale of those at Kensal Green or Norwood, whilst the small catacomb at Nunhead beneath the remains of the Episcopal Chapel is sealed. 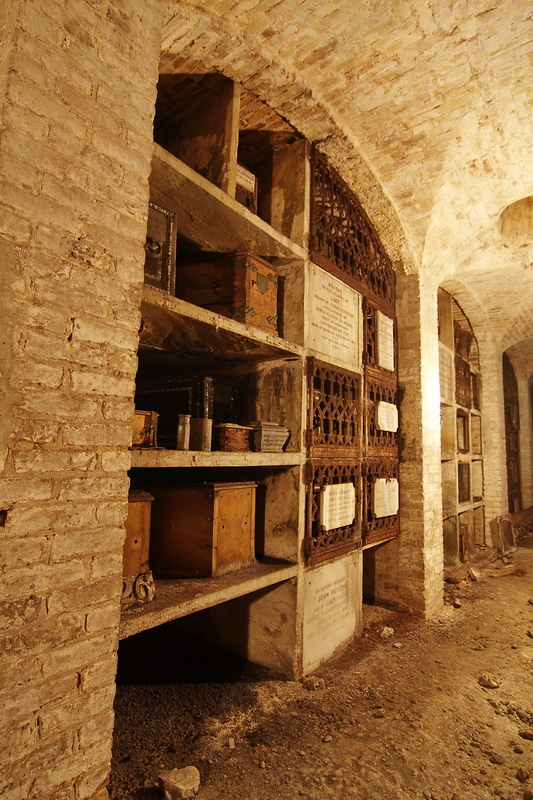 Catacombs were of course provided in some other English cemeteries, such as those at Church Cemetery, Nottingham, built into the site of a former quarry. house cremators and associated equipment. 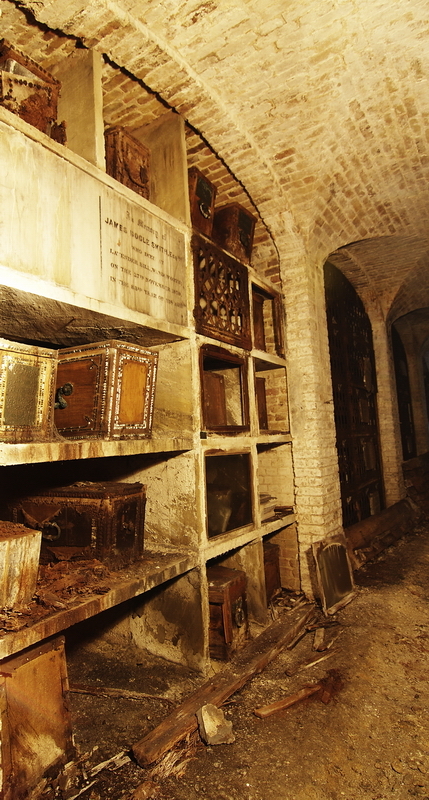 The fate of the coffins they once held is unknown. 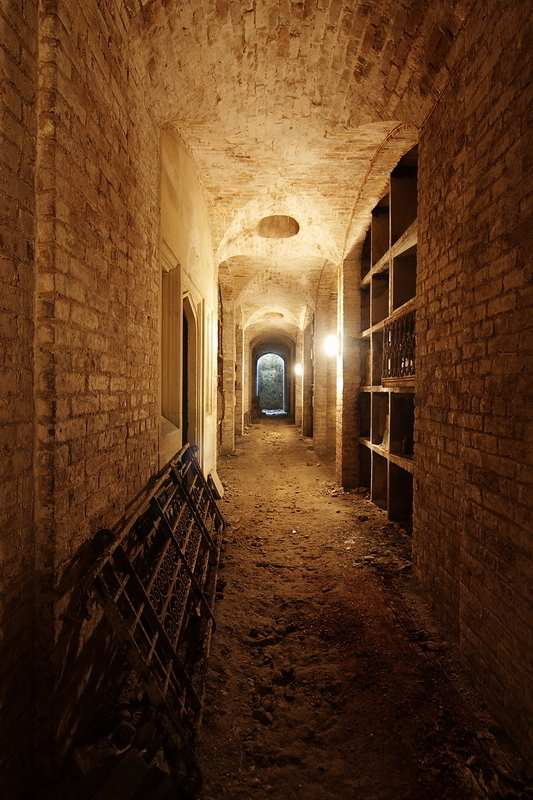 The corresponding catacombs at Kensal Green have been sealed. 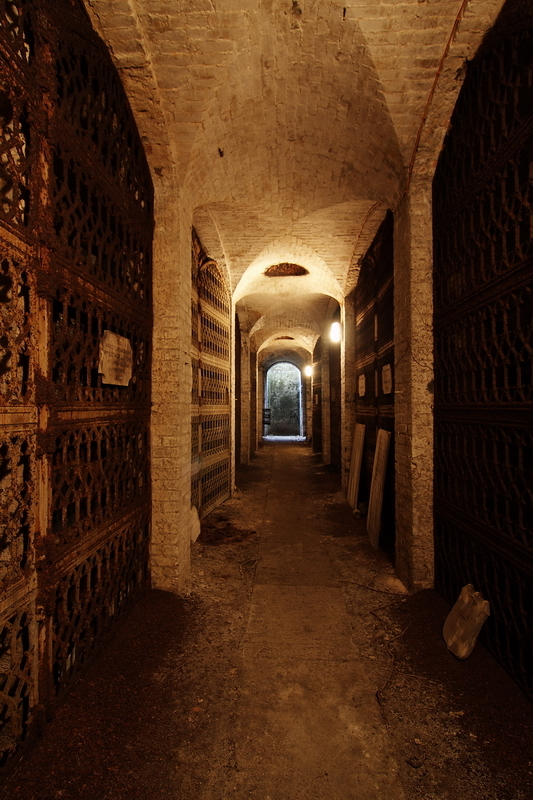 However, the catacombs beneath both Episcopal chapels survive. 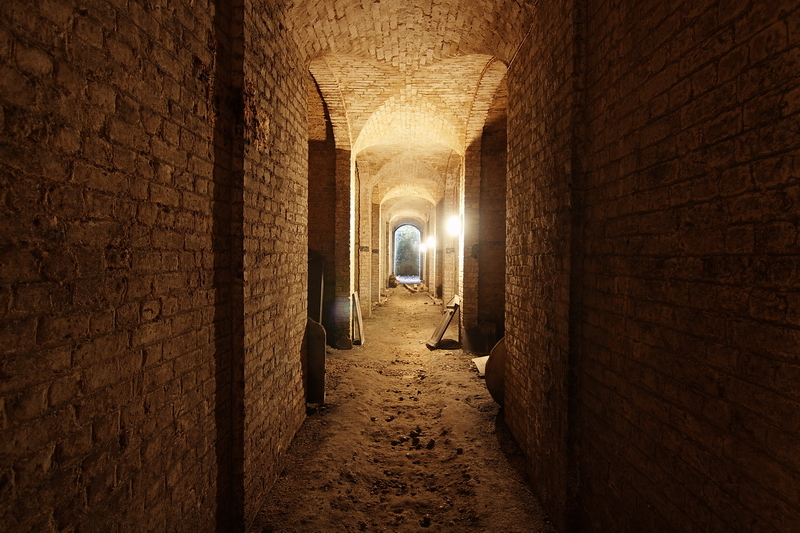 Those at Norwood consist of a series of brick vaults supported on brick walls and piers. The layout is regular and symmetrical, and consists of a tall central gallery, which corresponds to the location of the demolished chapel, and six corridors running at right angles to this gallery to the North and South that give access to the vaults. 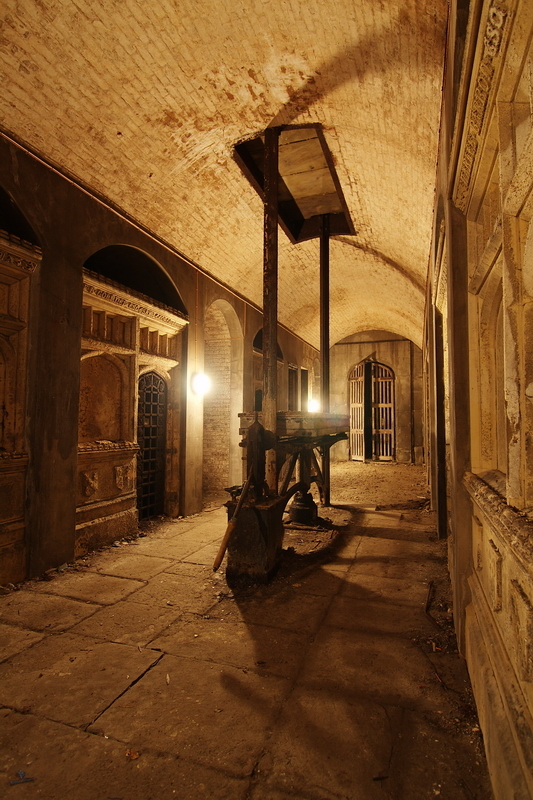 Access to the catacombs is now via an external staircase to the East end. There is a further staircase, which would have led down from the interior of the now vanished chapel above. left open – in many the remains of funeral tributes placed there by mourners are still visible. 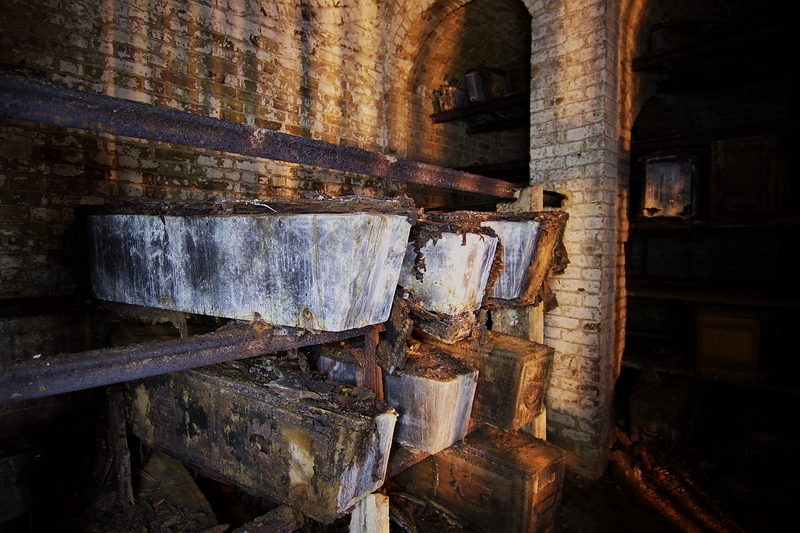 An estimated 2,500 coffins are located in those vaults and are supported either on stone shelves, on cast-iron bars suspended between the brick pier supports, or rest on the floor. in lead-lined coffins. 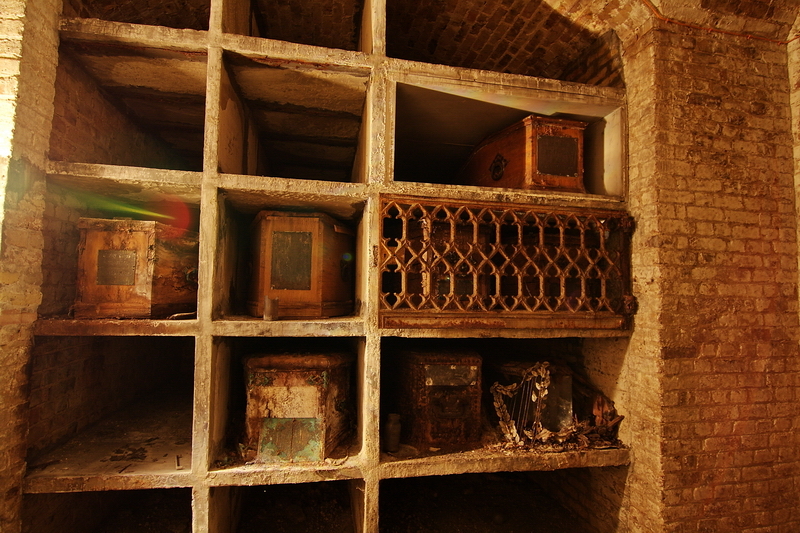 There has been much decay over the years, but generally the lead coffins are intact, although a few have been desecrated. 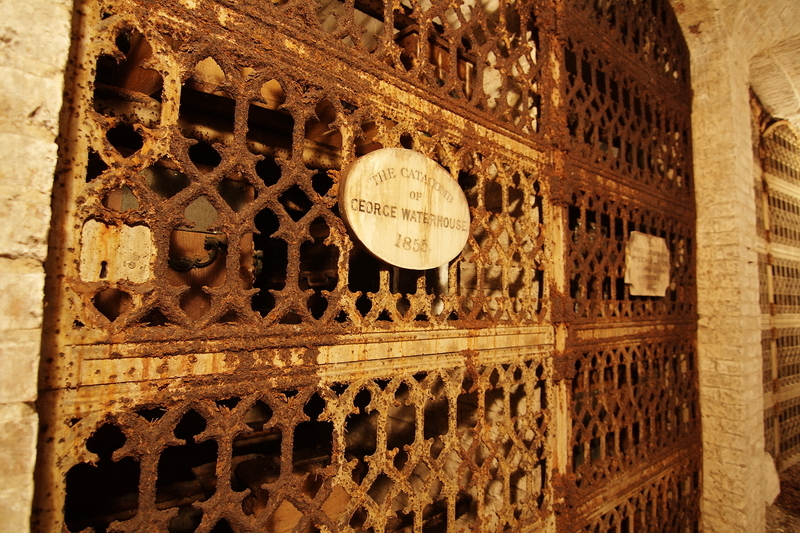 Some massive hardwood coffins, however, remain in fine condition, although many brass nameplates and fittings have been stolen. 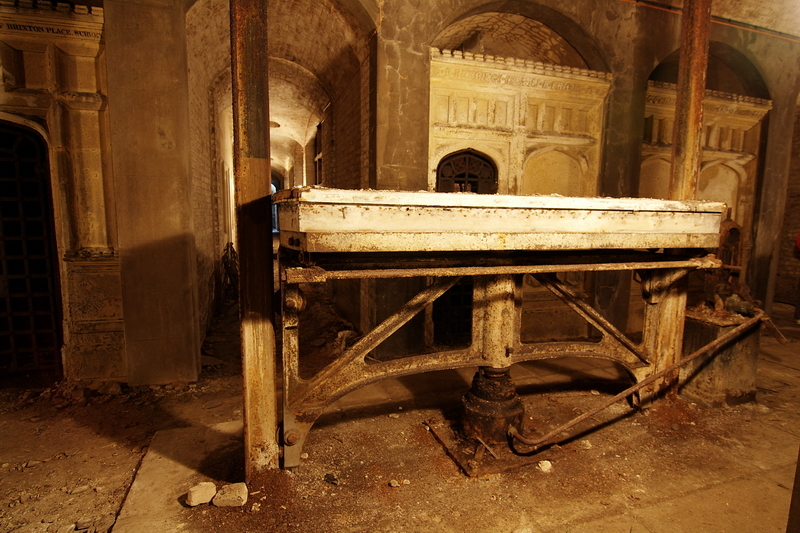 The central bay contains some impressive mortuary chapels with elaborate architectural detail in Portland stone and in cast iron, much of it now sadly rusted. Pride of place goes Sir William Tite (1798-1873) himself, who is interred in Catacomb 90 together with his wife. 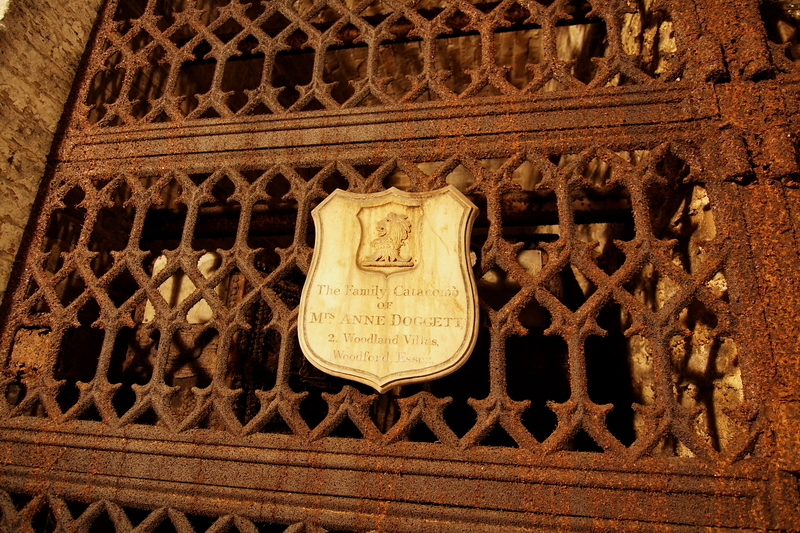 Vice-Admiral William Young ( ?-1847) has an impressive catacomb chapel part sealed behind an open ironwork door. Young was an officer in the Royal Navy for nearly seventy years, and was at one time in charge of Deptford Dockyard. ‘He was distinguished not less for zeal, ability and courteousness in the discharge of his public duties than for simplicity of manners, love of truth and practical benevolence in private life. Erected by widow and children to testify their affectionate and reverential attachment to his memory’. He was a Vice-Admiral of the Blue and lived at Denmark Hill, Camberwell. He was buried on 19 February 1847, aged 85. 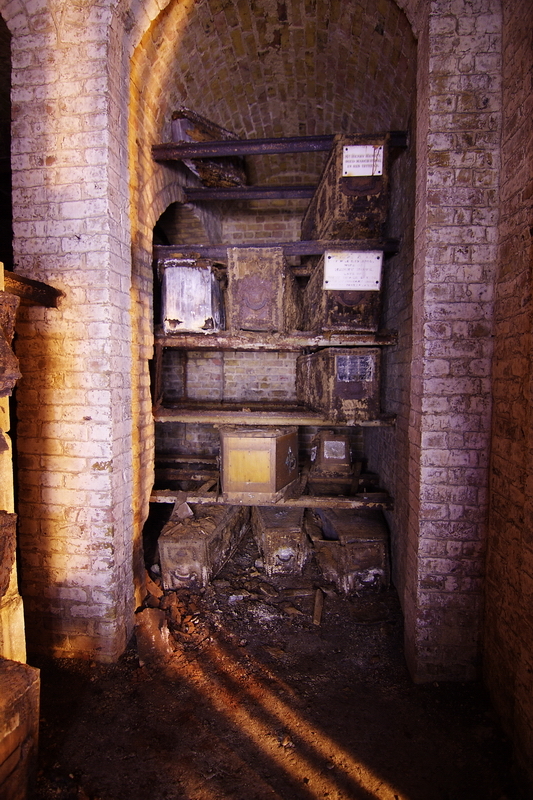 Elsewhere in the catacombs are stored various items such as Victorian grave diggers’ spades and the memorial plaques removed from the chapels and arcades when they were demolished, including that to Sir William himself. There is also an attractive carved wooden plaque to Pilot Officer Edmund H(ugh) C(raft) Theobald RAFVR (1915-1942) that records that his Hurricane fighter-bomber of 30 Squadron was shot down during ‘Operation Crusader’, the final relief of Tobruk, on 28 December 1942. He is buried at Halfaya Sollum Cemetery, Egypt. encountered with the screw-jack coffin lift at Kensal Green. repealed. The importance of the cemetery and the quality of its monuments were emphasized in 1978 when it was included within a conservation area, and in 1981 when the entrance arch, gates, walls and railings and 44 monuments were listed (seven Grade II*, the rest Grade II – a further 21 monuments have since been listed). It has been recently been awarded Grade II* status on the English Heritage Register of Historic Parks and Gardens. 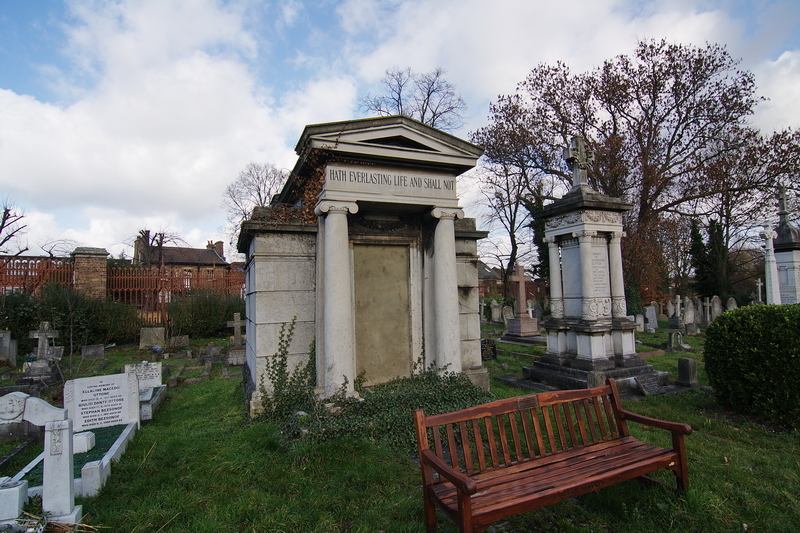 Despite this apparent protection in law, the cemetery was subjected over a couple of decades by Lambeth Council to a programme of ‘lawn conversion’. During this period, well over 10,000 monuments were removed, ignoring rights of grave owners and keeping no proper records of the position of graves. Moreover, nearly 1,000 private graves were resold illegally for new burials. The destruction was eventually stopped in 1991 (by which time two listed monuments had disappeared and several others had been badly damaged), by the Archdeacon of Lambeth who referred the matter to the Consistory Court of the Diocese of Southwark (80 percent of the cemetery is consecrated ground). 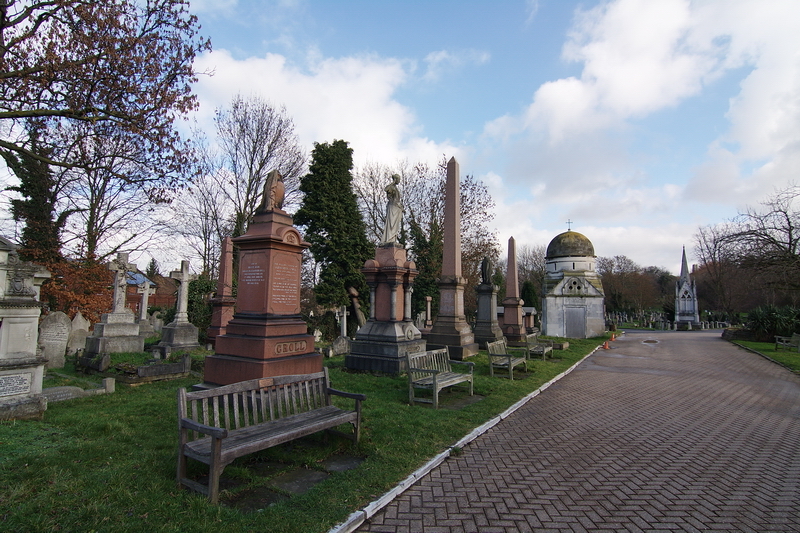 The power of management of the cemetery was delegated to a Scheme of Management Committee composed of representatives from both the Diocese and Lambeth Council. As ordered in the judgment, the Council has restored/repaired the disappeared/damaged listed monuments, and a landscape management survey has been carried out. 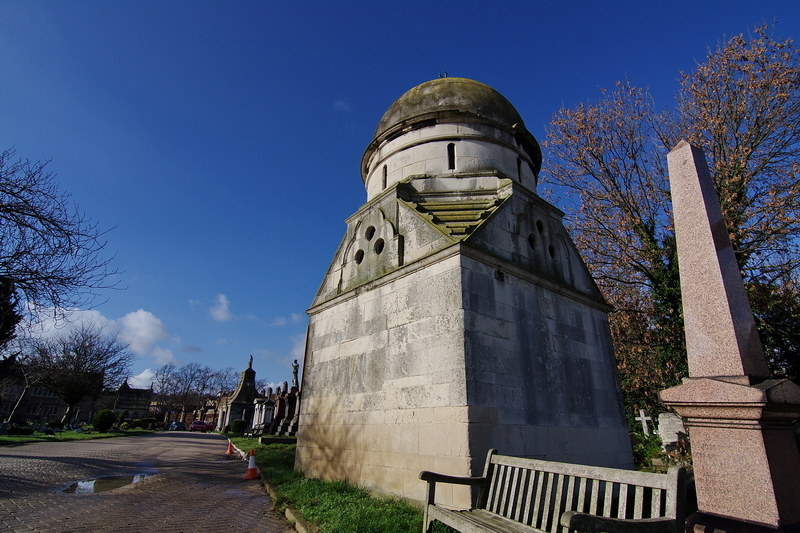 In the past few years, a concerted effort by the Council, English Heritage and the Friends of West Norwood Cemetery has resulted in the restoration/repair of numerous monuments, as well as parts of the wall and railings; plans were in hand for improvements to the drainage system and, perhaps eventually some restoration of the catacombs. But the Council is currently aiming to undo all this good work, remove monuments, and reopen the cemetery for burials. This despite the its unique place in the history of London, and indeed in the history of British cemetery architecture. Sadly the future for the catacombs looks increasingly bleak. (i) Hon Colonel Sambrooke Anson (1778-1846). Gazetted Lt-Colonel on 15 September 1809, he commanded the 1st Foot Guards in the Peninsular Campaign, 1809-13. (ii) Edward Charles Mackintosh Bowra FRCS (?-1874). One of the first British Commissioners of the Chinese Customs Service. (iii) Major-General Charles Alfred Browne (1801-1866) (Catacomb 16 D), son of William Loder Browne, merchant, of Kennington. He joined the Madras Army in 1826 and was gazetted Major-General in 1862 (see www.fownc.org/newsletters/no52.shtml for further information about the Browne family). (v) Sir John Cowan (?-1842) (Catacomb 36). Lord Mayor of London, 1837-8. (vi) James, Lord Hannen (1821-1894). A barrister and judge, Hannen was educated at Heidelberg University and was called to the bar, Middle Temple, in 1848. He became Junior Treasury counsel (government prosecutor) in1863 and was made a Judge of the Court of Queen’s Bench in 1868. He was knighted in 1868 and appointed to the Privy Council in 1872. A judge in the Courts of Probate and Divorce from 1872 and President of the Probate, Divorce and Admiralty division of the High Court, 1875-91, he was made Life Baron and Lord of Appeal in Ordinary in 1891. He was President of the Parnell commission, 1888-9, and an arbitrator in the question of the Bering Sea seal fisheries, 1892. He lived at Kingswood House, Sydenham, later the home of John Lawson Johnston (1839-1900, ‘Mr Bovril’), also buried at Norwood (grave 29,462, square 38). 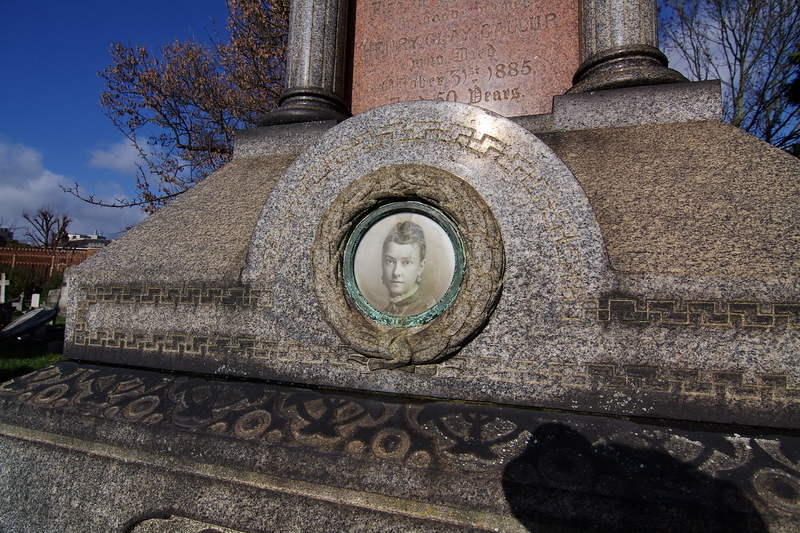 Hannen is commemorated on the family monument in the cemetery (square 61), but is interred with his wife and the cremated remains of his daughters in the Catacombs. cases the right to affirm as in civil cases, 1861. (viii) Sir Chapman Marshall (1787-1862) (Catacomb 37). Lord Mayor of London 1838-9. He died at Pembridge Crescent, Bayswater on 9 January 1862. (vii) Major John George Richardson (1786-1867). A Royal Marine, he was severely wounded in the mouth, in an arm and a leg on board HMS Africa in action with a Danish flotilla of gun and mortar boats while becalmed near the Malinor Channel, Sweden, in 1808. He died on 25 January 1867. (ix) James Bogle Smith (?-1870). A director of the Union Bank of Australia (now ANZ Bank), a post he held from 1837-70. From 1840 the UBA helped to finance settlers to New Zealand. Smith was also London agent for merchant-shipowners William Smith and Son of Liverpool, a trustee of the National Life Assurance Society, and Prime Warden of the Goldsmiths Company. He lived at Lavender Hill, Wandsworth. (x) Francis Sheppard Thomas (1794-1857) (Catacomb 34). Secretary to the Public Record Office, Chancery Lane, 1826-57. He wrote A History of the State Paper Office, 1849; Handbook to Public Records, 1853, and related works. He died at Croydon on 27 August 1857.